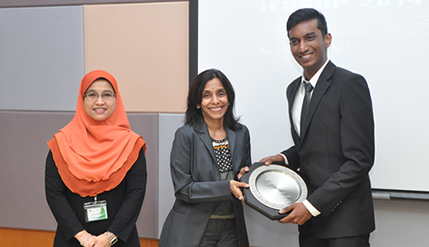 BANGI, 9 Feb 2014 –The National University of Malaysia (UKM) law students took the prize for Best Memorial in the Phillip C. Jessup Moot 2014 Competition which ended here today. However the University of Malaya team emerged as the overall champion in the competition and will represent Malaysia in the International Moot Competition stages to be held later this year competing against Law students from other universities including Australia, United Kingdom (UK), United States of America (USA) and India among others. UIA won second place in the overall standings. Teams from eight universities comprising a total of 40 students competed for the coveted awards. UKM is the host for this year’s competition. The universities, apart from UKM, were University Islam Antarabangsa Malaysia (UIA), University Malaya (UM), University Technology MARA (UiTM), University Sultan Zainal Abidin (UniSZA), University Sains Islam Malaysia (USIM), University Utara Malaysia (UUM) and Advanced Tertiary College (ATC). Surrendran Anan, of the UKM team was judged as the Best Oralist, receiving a trophy, a certificate and a personal book prize donated by Prof Myint Zan of the Multimedia University (MMU). Deputy Vice Chancellor (Student and Alumni Affairs) of UKM, Prof Datin Noor Aziah Hj Mohd Awal who presented prizes to the winners at the closing ceremony at the Law Faculty auditorium here today said the Philip C. Jessup Moot Competition is a prestigious and challenging event giving law students the platform to polish and practice their eloquence, quick wit and fluency to argue. It also gives them the opportunity to examine their strategic and analytical thinking and ability to render a spontaneously written memorial. Expressing her best wishes to the UM team that will represent Malaysia in the International stages of the competition, she reminded them that Malaysia has had very good records at the International level competitions. In the 1996 Competition, UM won the Evan Award for Best Memorial, in 2000 the UIA team won the Richard R. Baxter Award for Best Memorial, in the 2005 Melati Abdul Hamid of the UIA team won Best Oralist and in 2012 the team representing Malaysia also won the Best Memorial award. Such accomplishments showed that the students had made Malaysia and their universities proud proving that Malaysia’s education system is as good and comparable to those in the Australia, United Kingdom or the United States of America, she said. “It also showed that the level of English in Malaysia is improving and not as bad as others made it out to be. We proved that though English is not our native language, we can still compete against those having English as their mother tongue and at the highest level and even beat those students, ” Prof Noor Aziah said. All participants received certificates of participation, while UM and UIA teams received their trophies. Prof Noor Aziah also handed tokens of appreciation to the judges, Dato Zulkifli Adnan, The Director General of the Department of Maritime Affairs and Prof Myint Zan of MMU and thanked Shearn Delamore & Co for supporting the competition.